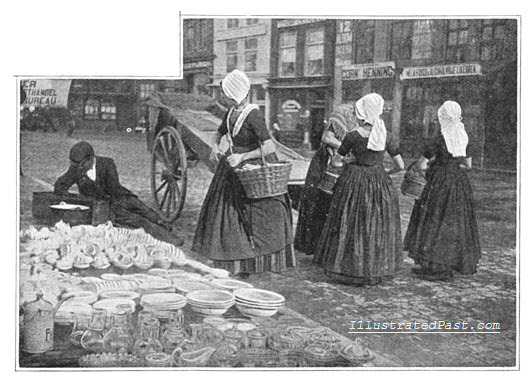 This is a pictorial journey back in time to 1906 Brittany. 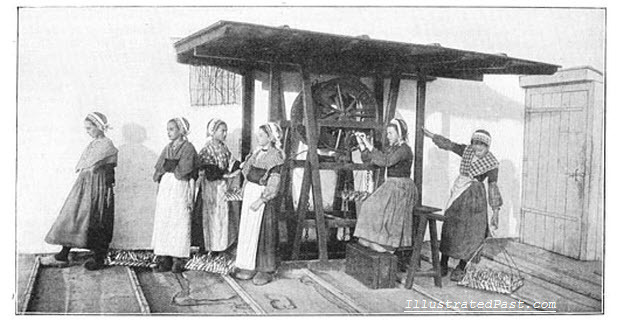 Brittany, a small corner of France on the English channel had for centuries retained its semi independence, its own customs and culture. It was a semi-independent Celtic duchy until it was annexed by France in 1532, but even then the rugged country side allowed the local people to lead a lifestyle insulated from the main cultural currents and changes that swept greater France. 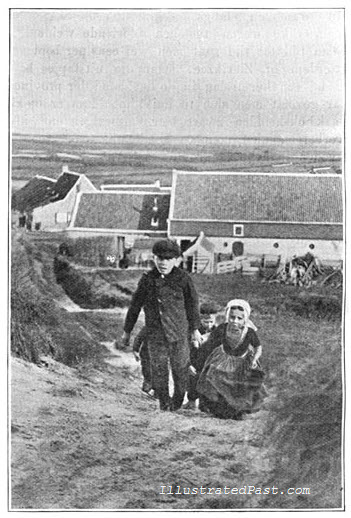 Even now local dialects known as Breton and Gallo persevere in the face of the dominant French culture. At the dawn of the twentieth century, before television and radio had begun their work of shaping mass culture, the south of Brittany retained an even more unique aspect than it does today. 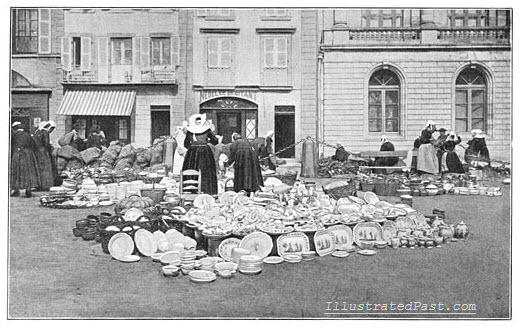 Our tour of old Brittany begins in the town of Quimperlé where an open air pottery market has drawn several women dressed in traditional Brittany costumes. Arriving on a night of bright moonlight, one finds a peaceful, quiet town, which looks fantastic, with empty streets and winding alleys, facades, which overhangs and receding down houses. The bell tower of Saint-Michel rises above the houses of the upper town. The blue moonlight shines on the stone colossus. All sleep the sleep of small towns that sleep; sleep really is the death of mankind. No step on the pavement of the streets, no noise of a carriage, not even the whistle of a train. All is silent, not like the nights of the great Paris, whose hollow ground rings with the noise from the the tubes and pipes of various services, the sound of all that is in motion. 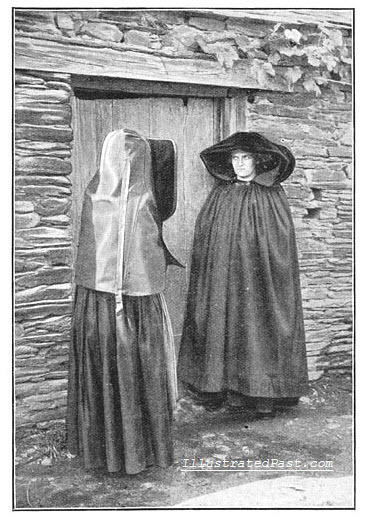 Here two women from Brittany wait outside a mourning chamber, where the body of a deceased lies. Their expressions and creepy hoods would scare the crap out of me! 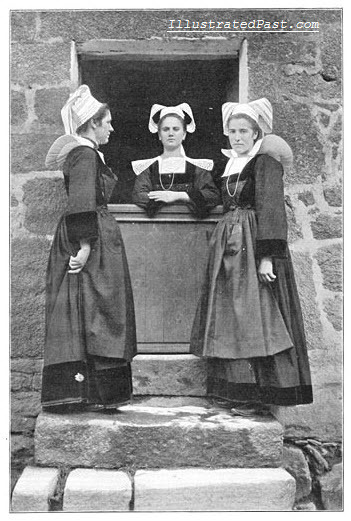 Below a trio of young women from Pont Avon in Brittany chat next to a doorway. They are wearing their peculiar traditional dresses that features wing like shoulder adornments. 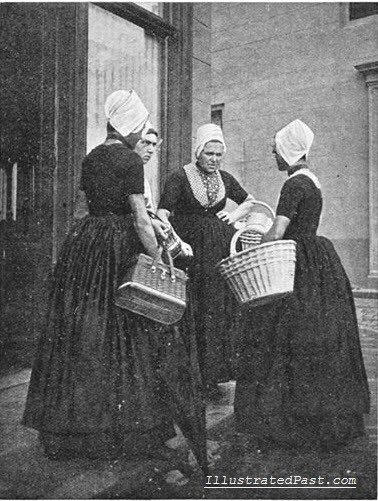 The girls of Brittany liked to make themselves look pretty and had a well -deserved reputation for flirting and coquetry. 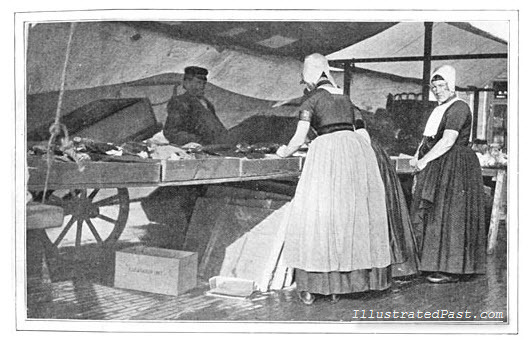 Brittany has always depended on the sea, and many men and women worked in the fisheries. 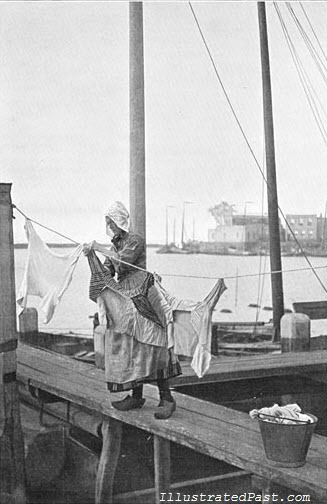 Here woman are setting sardines out to dry. Filling the cans of sardines. Note the lack of any automation. 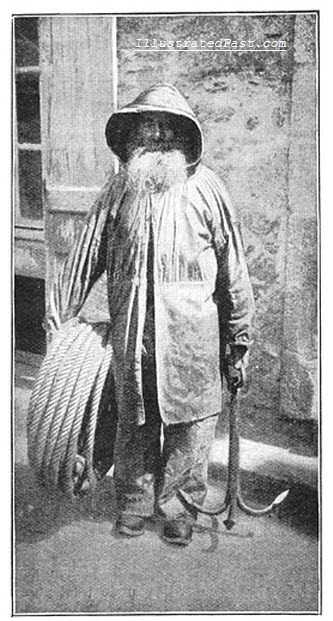 So now it is time to say goodbye to the grizzled old fishermen, and the pretty country girls of Brittany. 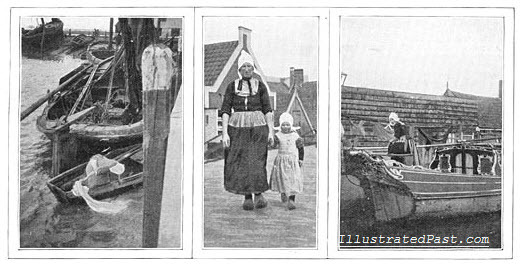 The following pictures of Holland were taken from a book written in Dutch called De Aarde en haar volken (“The Earth and Its People”) written in 1906. 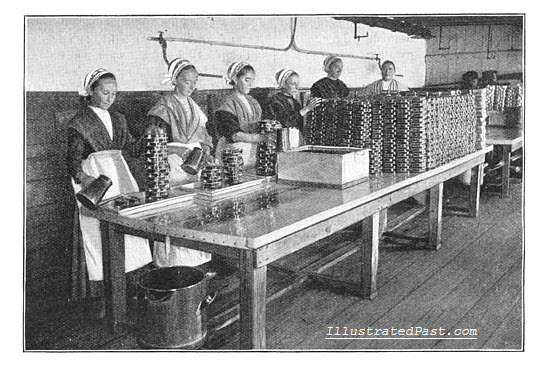 The photos show daily life in various parts of the world and offers a glimpse into a world far different than our own: a world were telephones, motor cars, electricity, antibiotics and most of the conveniences we now take for granted did not exist. Later articles will focus on different parts of the world as depicted in the book. 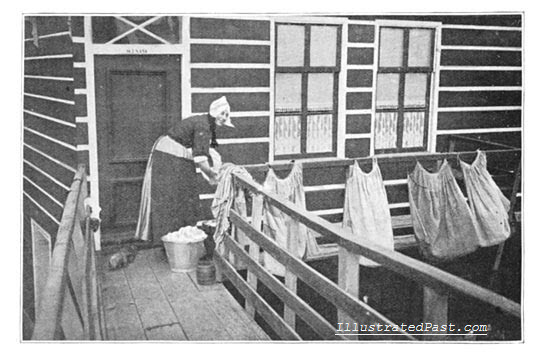 The original Dutch caption reads “Een mager oudje” which Google Translate says means “A Skinny Old Woman”. I am not sure if the picture is labeled correctly because this person does not look like a woman to me. The sign on the building in the background translates as Edek Music and Art Trade. 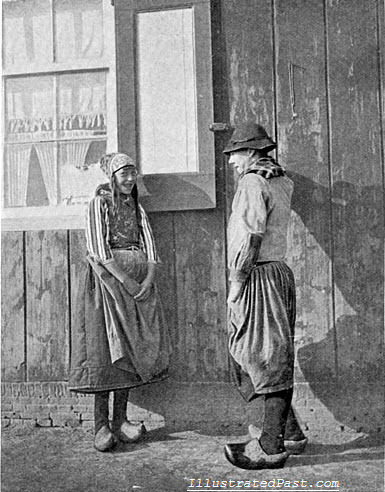 Above is a picture of a young peasant girl taken in 1906. 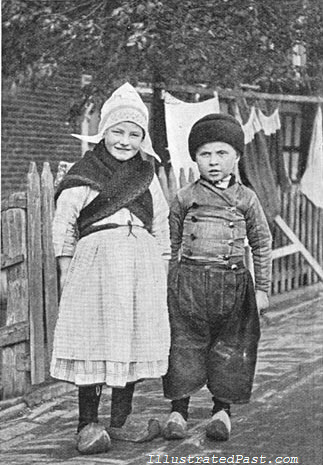 Although she is a member of the working class, the girl is well dressed in a traditional Dutch costume. 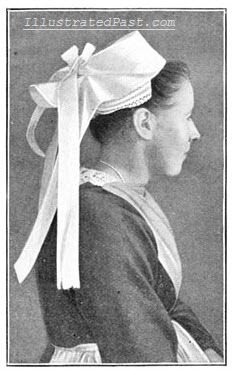 Her head is covered by a bonnet and she is carrying a large woven basket which is tied to what looks like a halter around her neck, presumably to help her carry the heavy load more easily. 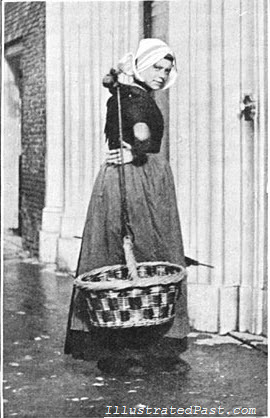 The basket is empty so it is difficult to tell what she would normally have carried, but she likely would have used the basket to carry goods to market or to bring food home. 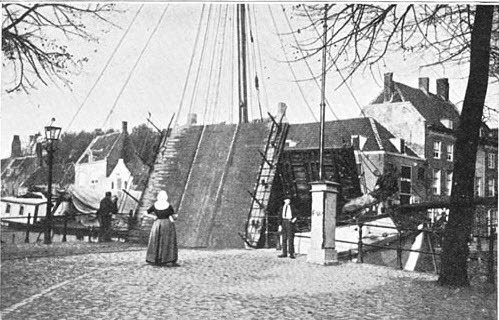 In this picture several Dutch men and women wait while a draw bridge is raised to allow a sailing ship to travel down a canal. 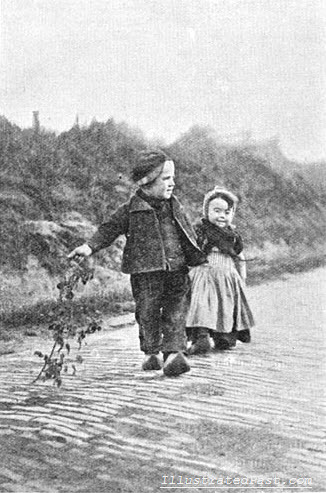 It is interesting to note that the road appears to be made of cobblestone and that the people waiting are all pedestrians. There are no cars or carriages waiting to cross the draw bridge. 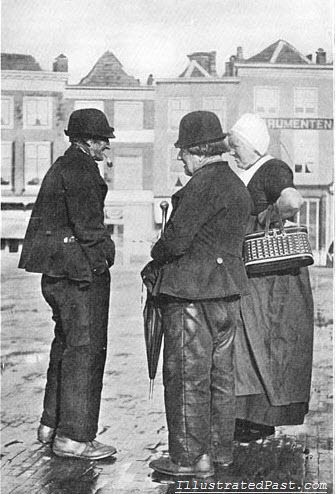 In this picture a married couple is chatting with an old man on a rain soaked cobblestone street. The original caption for this photograph reads “Conferentie over de dikte van de bieten.” which Google translates as “Conference over the thickness of the beat.” I am assuming that this is some sort of Dutch figure of speech for gossiping. 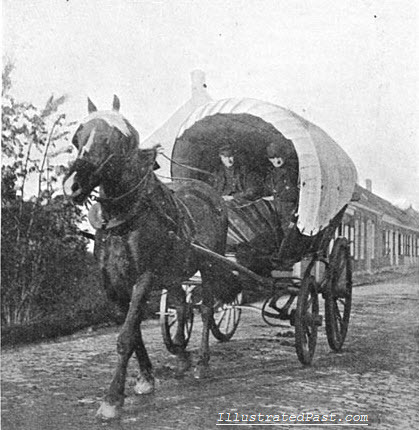 Two men are riding in a horse drawn cart down a cobblestone street in Holland. 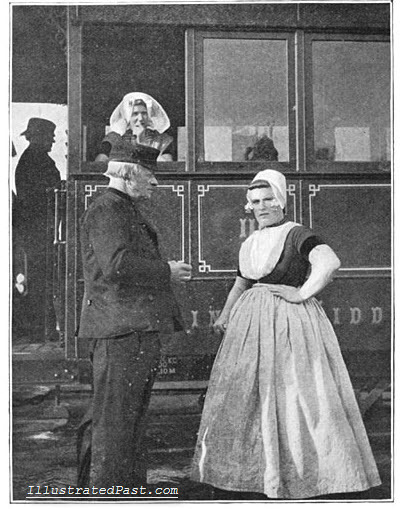 I think that this picture is of a man and a woman standing next to a train carriage. 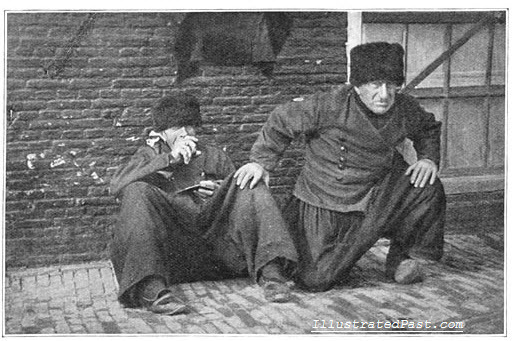 A Dutch grandfather and his grandson walk down a cobblestone street. 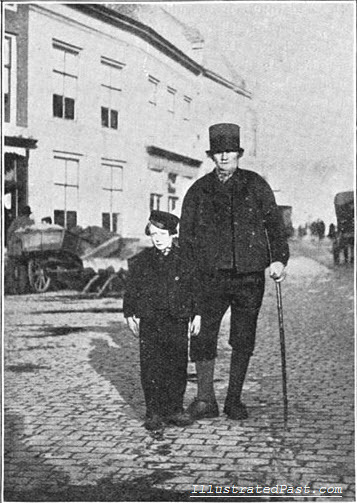 They look very stylish – the man is wearing a top hat and has a walking stick; the boy is wearing a suit. I wonder where they were going that day in 1906. 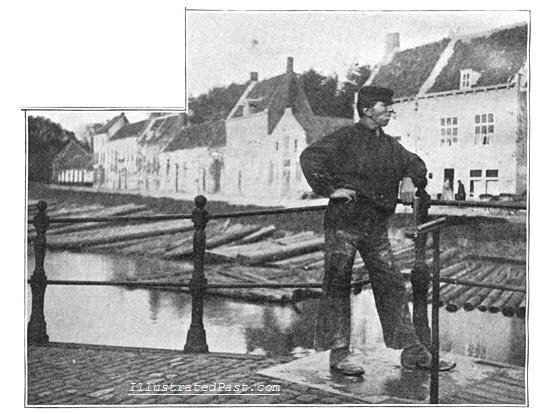 A bridge master, whose job it was to raise and lower the draw bridge to let ships and traffic pass through the canal, keeps watch. 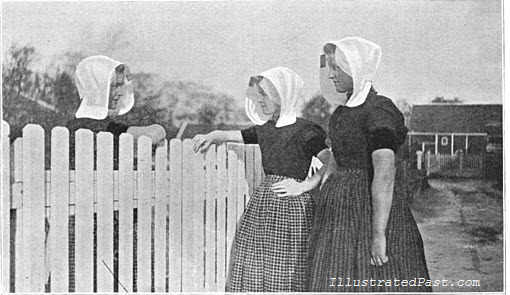 The innkeeper’s daughters gossiping with a neighbor girl over the fence. 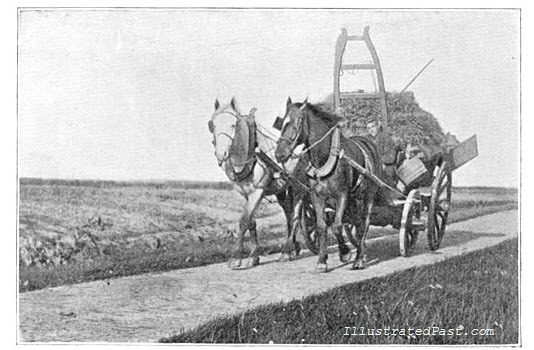 A cart full of hay is being drawn by two strong work horses. Note the extremely narrow lane. 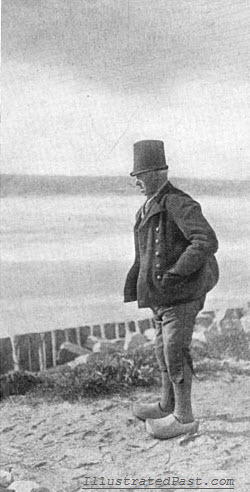 A Dutch man stands by the seashore looking out to sea. 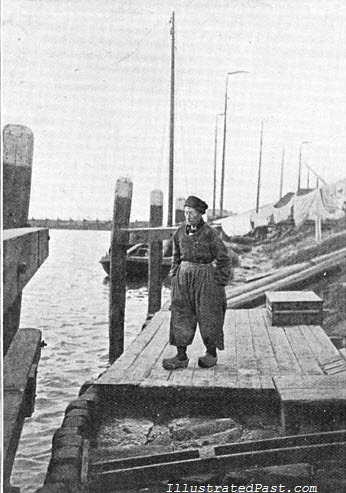 Note the traditional wooden clog shoes that he is wearing. 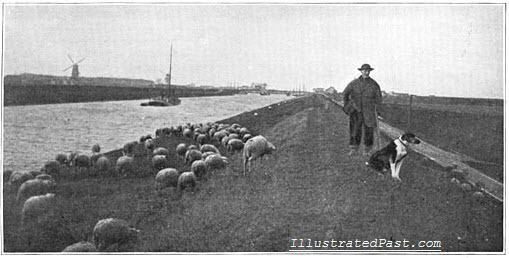 In this picture a Dutch shepherd and his sheepdog are grazing a flock of sheep on the banks of canal. Notice the stereotypical Dutch windmill in the background. 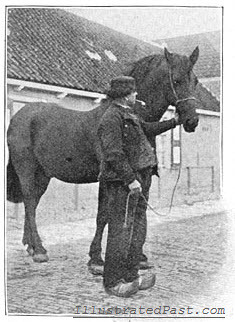 A pipe smoking man stands next to his horse. 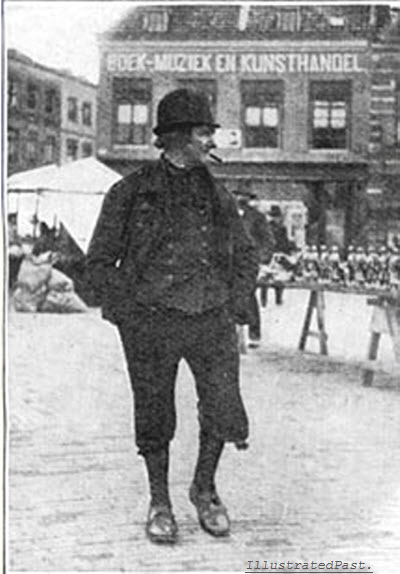 The man is wearing clog shoes which probably are not the best suited for riding. 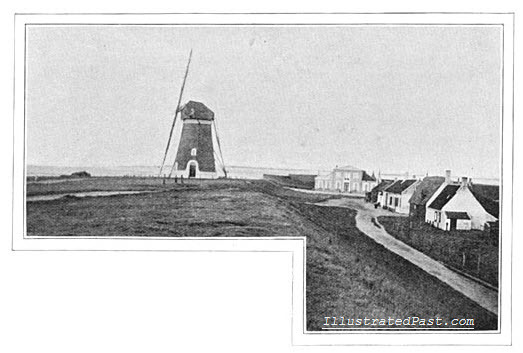 A large windmill in Holland, located on the Wemeldinge dike. 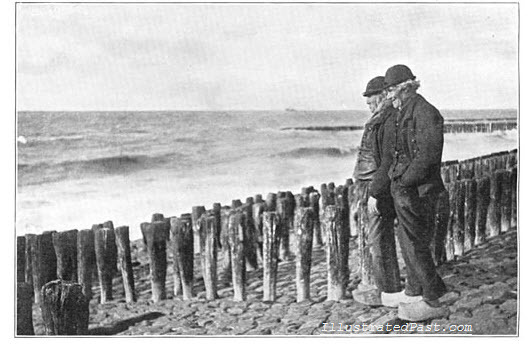 Two men look out to sea on the west coast of Holland. 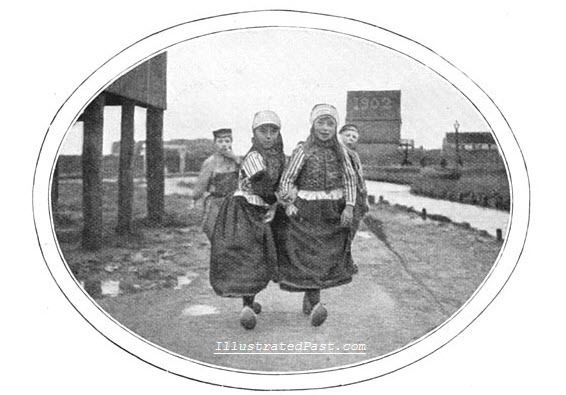 They are wearing Dutch clogs. The wooden stakes are to prevent erosion. 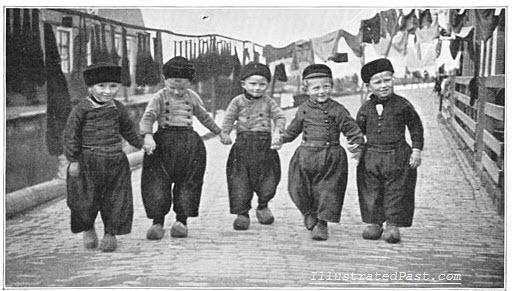 Dutch boys wearing clogs march down a quiet cobblestone street. 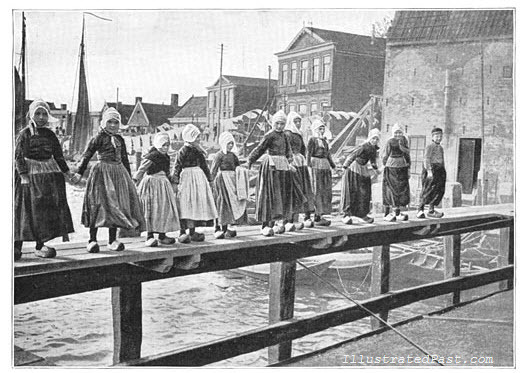 Their clogs must have made quite the racket. 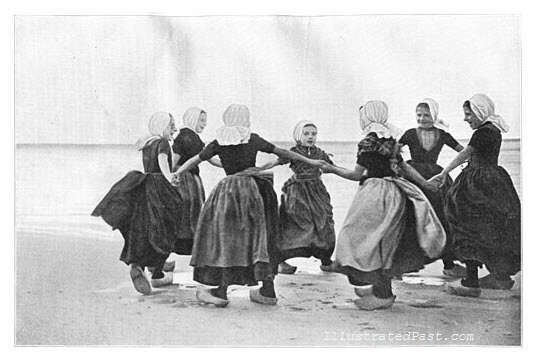 Traditional Dutch Dancing. Boys and Girls dance with clogs. 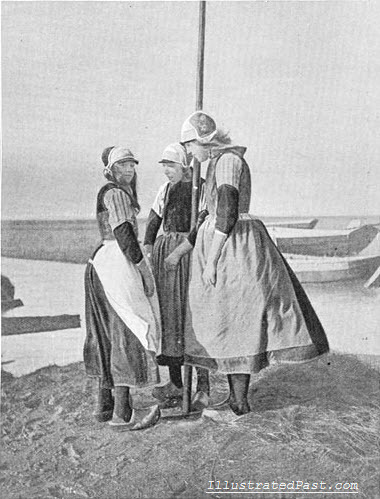 Dutch Girls Perform a Traditional Dance Around a Pole. Is this related to the May Pole? 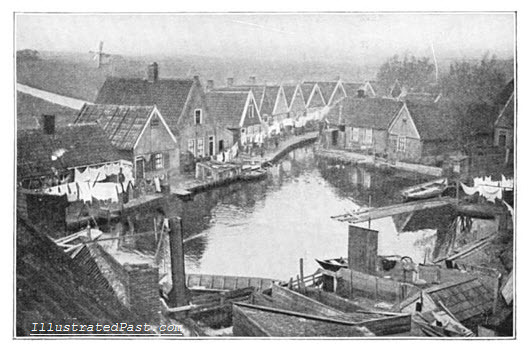 The Dutch Village of Volendam, in 1906. 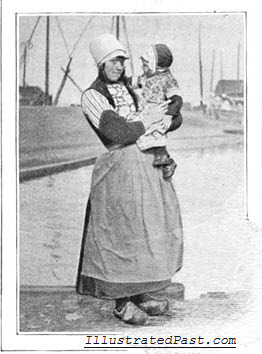 This brings us to the end of our journey back in time to 1906 Holland.